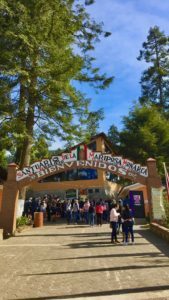 Visiting the El Rosario Sanctuary was by far the most magical experience I’ve ever had. 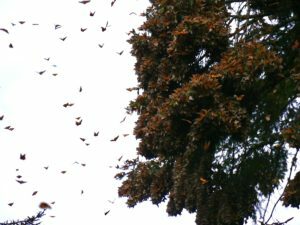 In early February, I flew to Mexico in order to witness and learn all about the miraculous Monarch Migration. 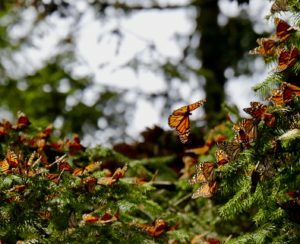 The monarchs fly all the way from Canada and the Northern United States (roughly 2,500 miles!!) 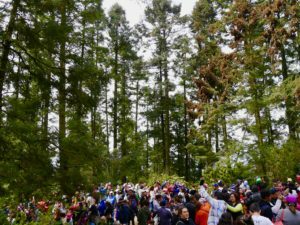 to forests in the state of Michoacan, Mexico. The forests they choose to roost in are at high elevations, roughly 11,000 ft and consist of mainly Oyamel Fir trees (Abies religiosa). 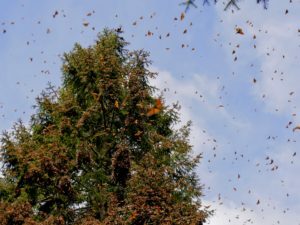 During these cold, sleepy months for the Monarchs, they need a boost in energy so they feed on the sap of the Oyamel Firs, which is high in sugar and nutrients. 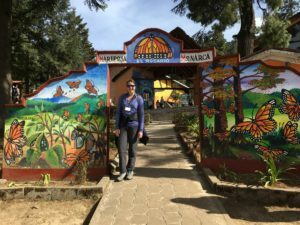 We stayed in the town of Angangueo, which is only 15 miles away from the monarch sanctuaries. It was a really cute town, the hotel, Don Bruno, was awesome! It was a little rustic, but we had fireplaces in our room that made it really cozy and perfect for those chilly nights. During the day it would be in the high 60’s to mid 70’s but then at night it was common for it to dip below freezing, it wouldn’t be far fetched for there to be a light snowfall. The first sanctuary we visited was El Rosario. We left the hotel around 8:30 in order to see the monarchs before it started warming up in the mountains. Once we arrived, the hike up was about three miles (distance varies daily), horses are available to rent if you don’t feel like battling the altitude change. I rented a horse, I wanted as much time with the monarchs as possible. After about a 30 minute ride, I dismounted and hiked another mile and a half. The forests were absolutely stunning, it was reminiscent of hiking through Yosemite, the trees were massive and made you feel like an ant in comparison, only adding to the wonder of the experience. As I got closer, I started to see people hiking back down to the mountain, a little girl passed me with a monarch perched on her head. Five minutes later I passed a group that had four monarchs attached to them. 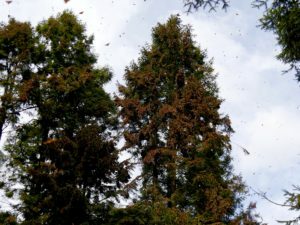 I was starting to feel giddy, then I looked up and saw the first monarch flitting through the trees. 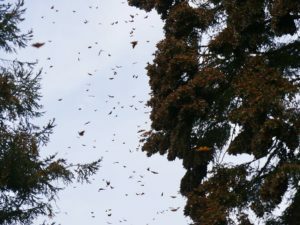 Finally, there was a break in the trees, and I saw monarchs, hundreds of them, flying all around the opening. 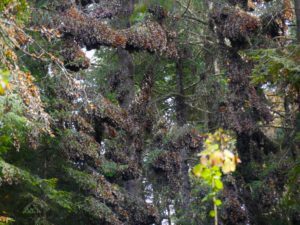 As I gawked, I realized that the trees were weighted down with monarchs, turning them orange and gray. While visiting the monarchs, it’s extremely important to be conscientious to the monarchs and the other guests, so you have to be quiet. There were rangers there who, during really exciting times, would shush the guests so that we could all appreciate the sound of the monarchs flying together. Luckily, it was early enough and not many people were there yet. I was able to walk around and really absorb how many butterflies I was actually seeing. Tens of millions. It was incredible. 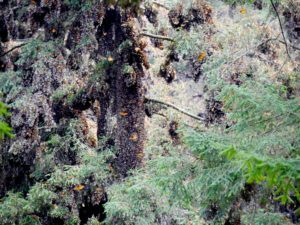 The monarchs clumped together and almost looked like beehives drooping down off the trees. They coated the tree trunks so that the bark was completely hidden from view. All you could see were flashes of orange as they pumped their wings to warm up. After about an hour of literally taking over a thousand pictures, the sun started to poke through the clouds. I thought I was amazed when I first arrived. Nope. 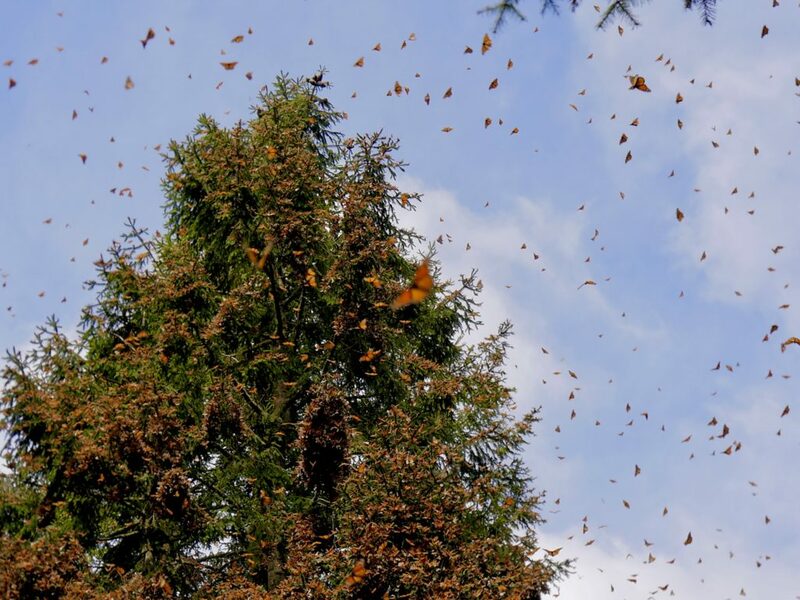 As the sun hit the clumps of monarchs, they broke up and dissolved into thousands of butterflies taking flight. The sounds was like paper being shuffled, just filling the air. The crowd cumulatively gasped and we just stood shoulder to shoulder in awe. So many butterflies took flight that they created shade over us. The light filtering through their wings was more beautiful than any stained glass i’ve ever seen. It’s difficult to describe such a sensation, but it was amazing to look around at all the people who have gathered. There were visitors from all over the world, some of which were from China, Japan, Norway, Sweden, USA, and Germany, there were many locals there as well. Everyone who was watching this event was in various stages of wonderment. Toddlers were smiling at monarchs that landed on theirs arms, parents were explaining the migration to their kids, it was amazing to see such a deep love of nature in everyone present.